A dropped catch and a missed stumping left Mumbai Indians coach Ricky Ponting a bit sheepish as he admitted a few things hadn’t gone to plan after they chose to bowl in the final match at Wankhede stadium for IPL 2016. The batting, though, couldn’t have gone smoother. Rohit Sharma struck his fourth fifty in four chases and nothing the Kolkata Knight Riders could do made a difference. There were six bowling options that Gautam Gambhir could use – all of them had played international cricket – to defend a total of 174 which he had helped build with his 29th half-century in the IPL. But his team relies on the spinners to effect a slowdown and drive the batsman into panicking. That was not possible with dew gathering on the outfield, making it quicker, and helping the ball come onto the bat better. Its impact was clear as Rohit and Ambati Rayudu struck 10 boundaries in 34 balls and as Kieron Pollard muscled his way to an unbeaten 17-ball fifty and sealed victory with his sixth six of the night. Gambhir, though, did not hide behind any excuses. He said the batsmen should have scored 15 more runs and added that as international cricketers they should know how to deal with dew. It was a case of adapting to a tough situation – as he himself did while batting. A sweet timer of the ball on the off side, bowlers often try to tuck him up to keep him quiet. So Gambhir opened up his stance which helped him clear the front foot quicker, allowing a smoother bat swing when he hit through midwicket. Twenty-two of his 59 runs came in that region, including a six and two fours. Mumbai could have dismissed him on 8 but Mitchell McClenaghan fluffed a simple caught-and-bowled chance in the second over. The other Knight Riders opener Robin Uthappa was given a life on 35 when Parthiv Patel missed a run-out. Chris Lynn, who was brought to lengthen the batting in place of fast bowler Morne Morkel, was dropped on 2 by Tim Southee, and when Yusuf Pathan offered a chance at redemption one ball later, Southee dropped the catch and conceded a boundary. No such mistakes plagued Mumbai’s batting, with Rohit’s timing and Pollard’s brute force finishing the game off with 12 balls to spare. The only thing that went right for the Knight Riders was their catching. A fine catch from Yusuf Pathan produced got rid of Parthiv in the second over of the chase. Suryakumar Yadav intercepted a missile on the long-on boundary to bring Rayudu down. And Lynn’s presence of mind on the long-off boundary to dismiss a dangerous Jos Buttler had left Mumbai needing 69 off 42 balls. In walked Pollard, who had seemed a bit slow in the field perhaps because of the knee injury that kept him out of the World T20. But with bat in hand, he looked very assured. Pollard struck his second ball into the sightscreen, pelted three sixes in the 16th over, curiously bowled by R Sathish and bashed three more in Jaydev Unadkat’s wrapped things up. “Pollard is peaking at the right time,” Rohit said at the presentation. The West Indian had come into the match with only 71 runs in six innings. 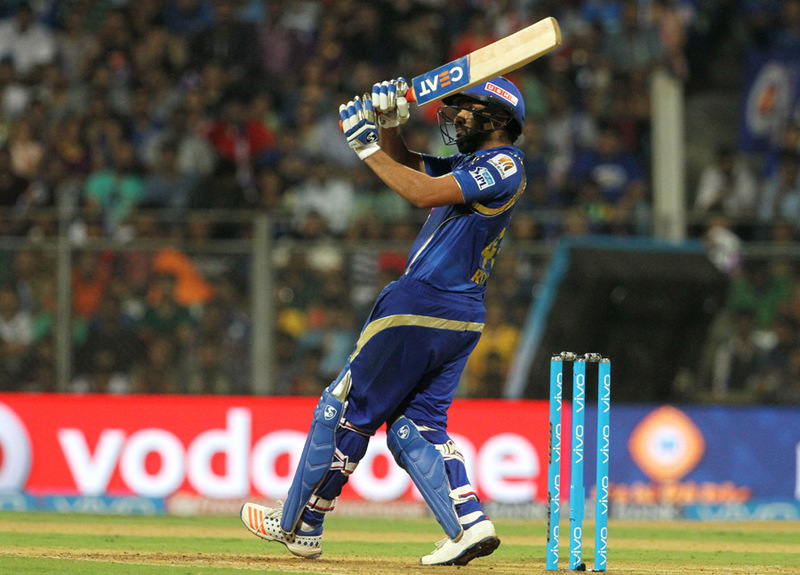 While Pollard’s contribution is a good sign for Mumbai going forward, tonight’s chase was built on Rohit’s 68 not out. He began with a rip-roaring six over square leg and pushed on with a pristine cover drive. None of his shots taxed him for effort and yet the ball simply flew away. His composure was also noteworthy and seeing off tight spells from Shakib Al Hasan (1 for 30) and Sunil Narine (2 for 22) went a long way in handing Knight Riders their second loss of the season.